Guitar Blog: "Am I too old to learn guitar?" "Am I too old to learn guitar?" I recently received an inquiry from a guy in his 40's asking if he was too old to learn guitar and if he was kidding himself. I am sure we all know the answer is you are never too old but I think it is a valid question. Ageing is a process we all go through. Determining whether spending 30 minutes or more a day is worth it if you are say 45yo is probably something you would want to know before you spend thousands of dollars on a guitar and lessons. So here goes. I am not going to give the typical response you would expect from a teacher who will obviously benefit financially from you enrolling for lessons so lets start with a reality check. As you age the body changes and we cannot deny that motor skills are slower to respond. Muscles memory is also slower to learn and studies show our brains begin to slow down their ability to learn around our late 30's. I would say almost all great athletes reached their peak before age 35 and many of the great scientists, philosophers etc did their best work in the first half of their life. There are exceptions of course but the reality is our body and brains are simply in a stronger healthier state in the first 30 to 40 years. Well we are talking about guitar here. It is not an Olympic event (as far I know). 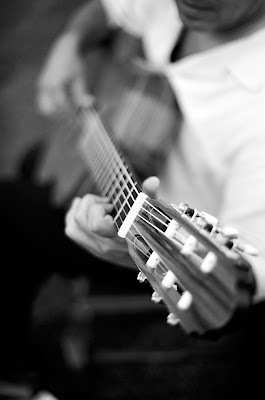 I have helped many older adults learn guitar even into their 80's and in many cases the process is easier. Ironically as we age we tend to be in less of a rush. My older students often have more time for themselves and because of their life experience understand that learning a new skill takes time. Older students seem to enjoy the process of learning more as well. On average younger students want results now. They don't want to learn they just want to be able to do it. Older students often have more time to practice. Their children are old enough to take care of themselves and they don't have to work so much as they are more likely to be financially secure. I have come across various studies being conducted on the brain. These effects are evident at all stages of life. Evidence shows that learning music improves memory and can slow down diseases like dementia and alzheimer's. Dr Patel Ph.D a neurobiologist who focuses specifically on the effects of learning music points out that we are affected in many ways. He lists emotion, memory, learning & plasticity, attention, motor control, pattern perception, imagery and more. Learning music to the brain is like physical exercise to the body. As you age learning a musical instrument may be the best thing you can do for your brain. One experiment I saw a few years back showed elderly people learning piano for 30 minutes a day. Six weeks later they had very obvious improvements in memory and certain cognitive abilities. When we learn music our brain literally carves out new neural pathways. Anyone who learns music knows that with practice things begin to change. For example your awareness of music changes and your hands (fingers) begin to take on a life of their own. There is this point where you realise your body can do things it once found impossible. My father inspired me to listen to the guitar greats as a child. Many of my fondest memories were with my father listening to the latest releases from the guitar legends. Clapton, Santana, Led Zeppelin, Pink Floyd and so on. So naturally when I was old enough I really wanted play guitar. My father on the other hand did not play guitar. His parents wanted him to play piano but he was not interested. As happens as an adult life gets busy and my father found himself later in life wanting to play guitar. By then I was a teacher and so I fully encouraged him to learn. Today whenever we get together instead of just listening to guitar legends we jam on our favourites. And I should add that he is getting very good. In fact in some areas he is probably more advanced than I. After all he has been listing to music for many more years. So you can see its not only never too late it is highly recommended. If you want to see Dr Patel's presentation follow this link. So you wanna be in a band?